Housing from steel, hardened and burnished. Threaded spindle hardened and burnished. Screw pump no. 6901-20 is supplied with 2 grooved nuts. Oil supply via threaded port. The screw pump is particularily suitable to operate small clamping fixtures. 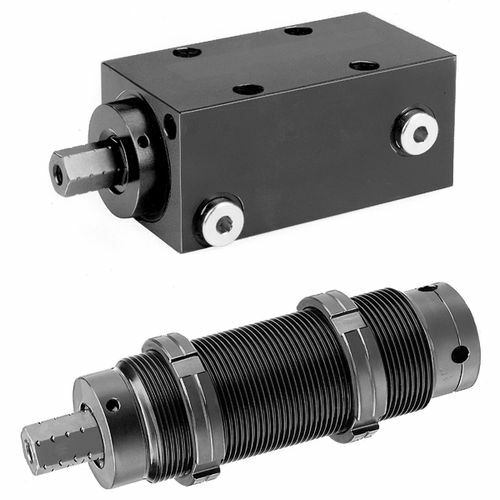 For an enclosed circuit the following has to be considered: The hydraulic clamping elements connected to the screw pump have to be hermetically tight. Due to possible leakage of the clamping cylinders during stroke movement and the compressibility of oil (1% at 140 bar), the stroke volume of the screw pump shall be used up to 70% only. The compressibility is being increased considerabely by air content in the oil. Therefore the hydraulic system has to be carefully purged of air. An air bleed screw at the highest position is a necessity. After returing the spindle of the pump, oil must be refilled at this spot. No air pocket should arise in the hydraulic system, which cannot be purged. A precise pressure control is possible by a manometer only. An electric pressure switch enables a pressure monitoring too. A pressure limiting valve is not suitable. Operating the threaded spindle by a torque wrench is possible. However the pressure should also be checked by a gauge. For the built-in version the mounting torque has to be observed.